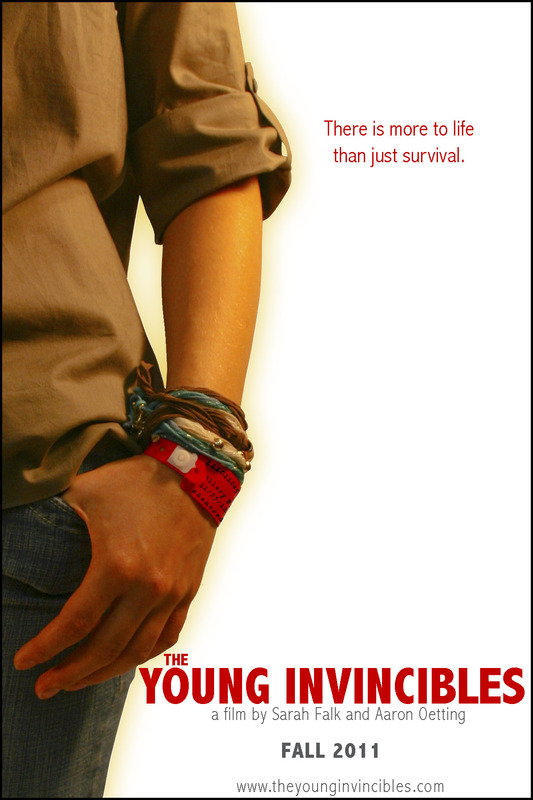 Michelle: Dana, of DanaTina Graphic Design, is the talented artist who created the teaser poster for The Young Invincibles. This week I had the pleasure of getting to know her professional and fanciful inclinations a little bit better. 1. How did you become involved with The Young Invincibles, and what made you want to work with a project about young adults with cancer? DanaTina: I found the project on an online posting and it immediately caught my attention, especially because it is an independent film. I love independent movies and am always eager to support their making. After I found out its subject and read the script, I was inspired by this character-driven story; I saw the need to portray the hardships and challenges of life paralleled by cancer. Family experience made me quite sensitive to the movie’s subject as well. To be honest with you the script made me tear up. And that was my sign: THIS is my project! 2. What was the process in creating the teaser poster? DanaTina: The process from start to end was quite smooth. It is a pleasure working with Sarah and Aaron. They are warm people and are able to express and exemplify their vision. The communication between us was clear and this is something that is valued in any collaboration. I constructed a visual concept around the medical bracelet, an item that all people who have been in a hospital have in common. Although it identifies you, it doesn’t say who you are outside of the hospital. As many things in graphic design/visual arts, it breaks down to the representation of the common denominator of which all people can understand. Just as a smile is recognized across all cultures to be a sign of joy, so the hospital bracelet understood to be a symbol of medical care in a hospital just as other universal symbols such as gender specification on the bathroom door, or the arrow pointing for safety during a fire, or the crosswalk light that guides us safely through the intersection. 3. Do you sing in the shower, in the car, or both? DanaTina: Neither, haha… unless my husbands does and I join him. I do sing when I cook though, and randomly burst into singing while moving around the apartment. The YI: Funny you should say that. Apparently Sarah has similar singing habits! 4. How did you get into the visual design business? DanaTina: I was always attracted to visuals. When I was in high school I wanted to go into advertising. I was fascinated by it. But after working with an advertising agency in college, I saw the process of art change into something solely commercial and sales-oriented. I found my passion directing me somewhere else. Having always created visual presentations for various purposes, I naturally found myself in the field of photography, quite amateurishly, but with great results. For some reason I thought it would be challenging to establish myself solely as a photographer, however I found myself incorporating my photographs into various layouts using different artistic techniques. It was a natural evolution into the realm of what I call broad-spectrum visual design. 5. If you were a fruit or vegetable, what would you be and why? DanaTina: hmmm… I have so many favorite fruits… It’s hard. Raspberry: tastes great and is healthy, looks hard but is delicate to the touch, grows wild and independent, it is hard to get rid of, but who would want to anyway? What else… Bears love them!!! The YI: That’s one of the best answers I’ve ever heard to that question. High Five! 6. Is being an artist in New York difficult or easy? DanaTina: It is not easy, although easier than other places, probably. People in NYC are open to artistry and they appreciate it. One of the good things about being an artist in NYC is that you have the opportunity to let your individual style flourish. Plus there is so much inspiration all around you! What is hard about being a graphic artist is the fact that work is sometimes taken for granted and not appreciated at its real value. However, if one is passionate and dedicated, that won’t slow them down; if anything that will make them even more determined. 7. Browsing your website you’ve worked with a wide variety of projects and organizations, which is pretty awesome. Care to tell us a bit more about your work? DanaTina: Yes, I love variety! I am what I like to call a broad spectrum designer. While others strive to find a niche to be successful, I feel that variety is good for the soul and keeps your skill-set sharp and fresh; experimentation with one mode of working expands one’s understanding of the others, integrating knowledge and unique creativity. Also, it is the nature of freelance work that allows you to expand into new territories with an vast array of people from all walks of life and cultures. 8. What 5 people, alive or dead, would you want to have over for a dinner party? DanaTina: My husband, Karl Jung, Paolo Coelho, Buddha, DaVinci. 9. Do you have a favorite piece you’ve made, professional or otherwise? DanaTina: Yes, I knew that would come up in conversation …besides the teaser poster for The Young Invincibles you mean? 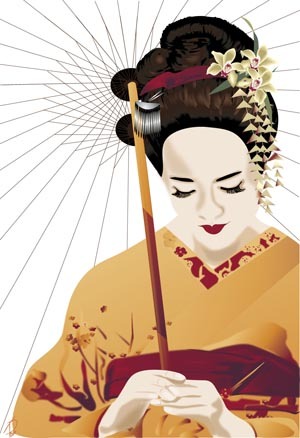 I think one of my favorites would be “Geisha” – an illustration I created based on a novel that I love, Memoirs of a Geisha by Arthur Golden. I read the book when it first came out and I kept a fond memory of it. The movie made it more popular, I assume. It was a project I worked on with a lot of passion. DanaTina: “Do not go where the path may lead; go instead where there is no path and leave a trail” – Ralph Waldo Emerson. The YI: Awesome, Dana. Thank you so much for sharing your time and answers with us! DanaTina: Thank you, Michelle! It’s been a pleasure.